On October 25, 2013, the US Nimitz class aircraft carrier USS George Washington entered Manila Bay. At the head of Carrier Strike Group Five, the aircraft carrier had spent the past week sailing the disputed waters of the South China Sea, visiting various regional claimants. Washington is seeking, through this show of military force in the region, to shore up its slipping diplomatic position in the wake of Obama’s absence from the Asia Pacific Economic Conference (APEC) and Association of South East Asian Nations (ASEAN) summits in early October. Obama canceled his travel to Southeast Asia to deal with the government shut down. His absence at the summits was seen as a clear indication in Asia of the declining economic and diplomatic power of Washington. Beijing seized upon the opportunity afforded by Obama’s no-show to conduct a ‘charm offensive’ in South East Asia. Prime Minister Xi Jinping and Premier Li Kejiang traveled throughout the region meeting with heads of state and dispensing economic largesse in the form lucrative new trade deals and investments. Obama’s absence raised questions about the seriousness of the US ‘pivot’ to Asia, which includes the shifting of the majority of US forces to the Indo-Pacific in a calculated strategy to encircle China. Countries throughout the region, most notably the Philippines and Vietnam, have engaged in increasingly aggressive assertions of their claims to the South China Sea, spurred on by Washington’s pivot. In the wake of the ASEAN summit, the bourgeoisie throughout the region were left uncertain if, in the event of conflict with China, Washington would be willing to intervene militarily, and further, if it could afford to. Unable to match the economic hand-outs of Beijing, Washington is shoring up its diplomatic and political power in the region through the escalation of its military presence. Every stop of the Fifth Carrier strike group was directed to this end. The USS George Washington heads Carrier Strike Group 5, which is the largest such group in the US Navy. It includes two guided missile cruisers, a destroyer, a supply ship and a fast attack submarine. There are over 6,000 military personnel on board the aircraft carrier alone. On Sunday, the USS George Washington was 200 miles off the coast of Danang, Vietnam. According to the Huffington Post, “a group of high-ranking Vietnamese military officials was flown onto the carrier Sunday along with other Vietnamese government officials and the U.S. ambassador to the country.” The location is highly symbolic as Danang was a key US airforce base during the American war in Vietnam, and US aircraft conducted bombing runs over Vietnam and Laos from the airbase. Commander of the George Washington airwing, Captain Ross Meyers told the visitors: “The strategic implications and importance of the waters of the South China Sea and the freedom of navigation is vital to both Vietnam and the United States.” ‘Freedom of navigation’ has long been the code phrase used to justify Washington’s military drive against China in the region. It was announced that the destroyer, USS John McCain, would make a port call to Vietnam later in the week, where it would engage in joint training exercises. The exercises were also to include three ships from the Japanese so-called Self-Defense Forces. On Wednesday, the USS George Washington sailed to Malaysia. Sixteen ‘high-level’ Malaysian government officials were given a tour of the carrier, including Shakib Ahmad Shakir, deputy undersecretary of defense. The US defense attaché in Malaysia welcomed them to “1,100 feet of sovereign US Territory” while they sailed through the South China Sea and launched fighter jets. 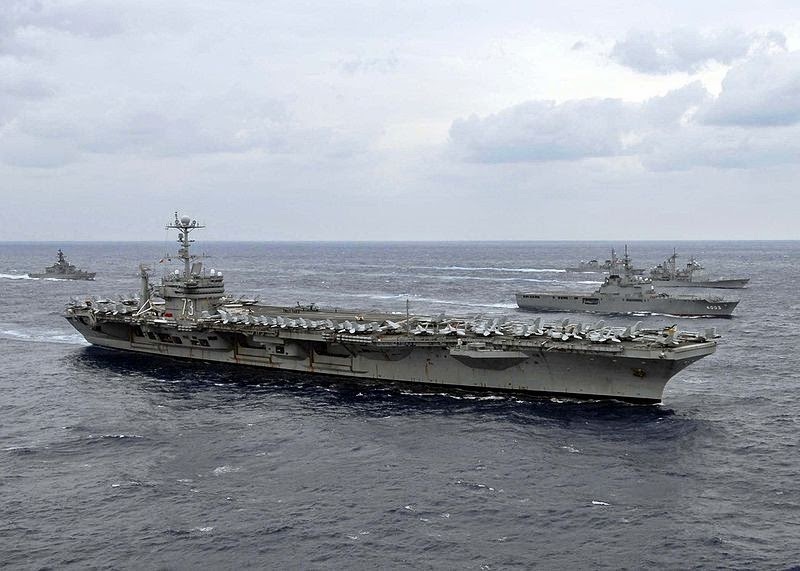 The carrier group staged joint military and naval exercises with Malaysian forces. Malaysian Defense Minister Hishammuddin Tun Hussein announced that Kuala Lumpur would be building a naval base on Bintulu in the South China Sea, just 60 miles from the disputed James Shoal where the Chinese People’s Liberation Army (PLA) had staged amphibious landing drills earlier this year. The base will house Malaysian Marines who, it was announced, will receive support, training and expertise exchange from the US Marine Corps. The Empire-controlled system administrators in the US job is to keep the insane military powers around the world whose real target is not China, Russia or any small countries—which are no threat at all to the British Empire—but America’s economic power and can-do legacy, inspired by the Roosevelt Administration—an operation from which America has never recovered. 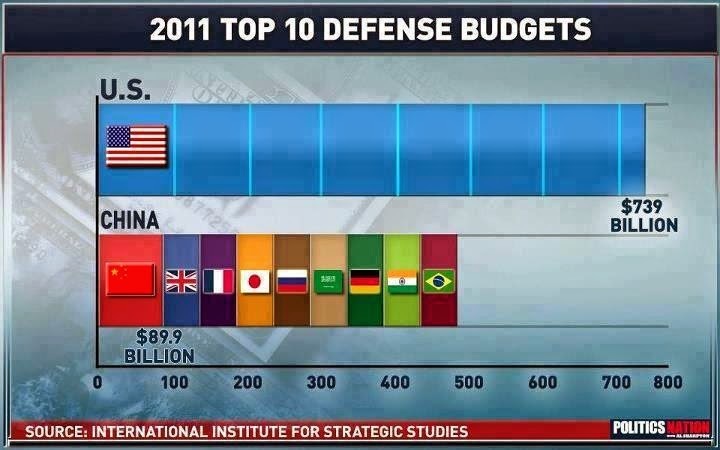 The main intention is to keep the United States in the State of bankruptcy. When this bankruptcy took place, the US Constitutional Republic was dissolved and replaced with a corporate democracy, social corporate fascism of the British Empire. They have been since 1933, trying to pay off a debt that the United States do not owe with a currency that makes the discharge of that false debt a mathematical impossibility. This bankruptcy, which can be considered nothing more than an international coup within the United States, was and is a complete fraud, perpetrated by the same international gangsters that accomplished the creation of the unconstitutional Federal Reserve. Some prominent names among these international thieves are Rothschild, J.P Morgan, Prescott Bush, Henry Kissinger, George Soros and of course our good friends the Rockefellers and their Standard Oil, who are just the Jesuits agents. They control the media (that why you never heard about them), the education system (surprise?) and they try to control the internet too. Washington has offered Kuala Lumpur the amphibious platform dock, USS Denver, after its decommission in 2014, and is also looking to sell Malaysia several AH-1Z Super Cobra attack helicopters, according to IHS Jane ’ s Defense Weekly . On the same day, the Los Angeles-class, fast attack submarine USS Santa Fe docked at Changi naval base in Singapore, showcasing to members of the Singaporean Navy its littoral combat capabilities. Leading Singaporean government figures were also flown out to the USS George Washington. On October 24, while sailing in the midst of the South China Sea from Malaysia to the Philippines, Rear Admiral Mark C. Montgomery, commander of the USS George Washington held a press conference with reporters from BBC, CNN, AFP, and other news agencies on the flag bridge with fighter jets taking off in the background. The ‘pivot’ has led to “an increase in surface combatant presence here in the Western Pacific… so these [US] ships are spread throughout those areas,” he stated. “Having more ships gives us more presence. It allows us to have a greater force.” The ‘pivot’ is “gaining strength,” he said. Just arrived in Manila Bay, it is reported that the USS George Washington will be hosting several hundred leading Philippine government, military and business leaders.